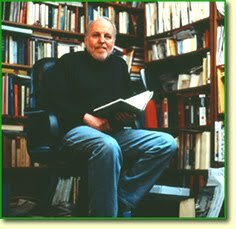 I am excited to share the news that J. Patrick Lewis has just been appointed the third Children’s Poet Laureate by the Poetry Foundation. The official announcement was made tonight at the Foundation’s Pegasus Awards celebration in Chicago. He follows in the footsteps of Mary Ann Hoberman and Jack Prelutsky, the previous Laureates. 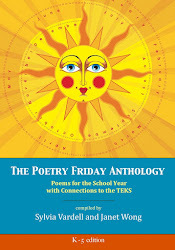 Here’s background information from the Foundation web site: Awarded by the Poetry Foundation for a two-year tenure, the children’s poet laureate aims to raise awareness that children have a natural receptivity to poetry and are its most appreciative audience, especially when poems are written specifically for them. They’ll be posting more about Pat, his work, and his award on the site shortly-- including a recent interview with yours truly. Congratulations to Pat—such an excellent and worthy choice. You may also remember that he is also the most recent recipient of the National Council of Teachers of English Excellence in Poetry award! 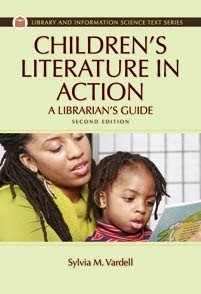 The official presentation of that award occurs at the NCTE conference (also in Chicago) in November. I would say that Pat is having a great year, wouldn’t you! Kudos, Pat! J. Patrick Lewis and his twin brother were born on May 5 in Gary, Indiana. Lewis earned his bachelor’s degree at St. Joseph's College in Indiana, his master’s degree from Indiana University, and his Ph.D. in economics from The Ohio State University. While working on his doctorate, he became an International Research and Exchanges Fellow, and he and his family spent a year in the former USSR. Later, he and his family participated in cultural exchanges, and they returned to Moscow and St. Petersburg for ten shorter visits. For over twenty years, Lewis taught Economics at Otterbein College in Westerville, Ohio, retiring in 1998. While teaching, he published widely in academic journals, newspapers, and magazines on the topic of economics. Lewis then turned to writing children’s poetry and took three years to study the craft of poetry on his own. His first book of poems for children, A Hippopotamusn’t, was published in 1990 and he has followed with nearly seventy more children’s books since then, most of which are poetry. He is also a contributor of children's book reviews for the New York Times and a frequent speaker at schools and conferences. 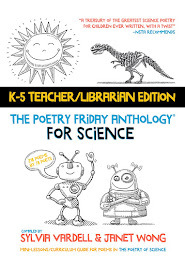 The themes and subjects of J. Patrick Lewis’ poetry collections are incredibly wide-ranging with a frequent focus on science related and historical topics. 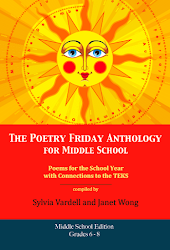 In addition, he enjoys experimenting with poetic form and wordplay and has authored everything from narrative poems to concrete poetry to limericks to riddles to haiku. To begin, share Lewis’ tribute to the library entitled “Necessary Gardens” (Please Bury Me in the Library, Harcourt 2005), an eight-line acrostic poem with each letter of the word “language” used to begin a line of the poem. 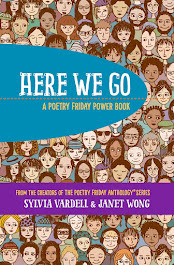 After reading the poem aloud once, find eight volunteers, one for each word/line, to “pop up” and read/say each line wherever they are seated. 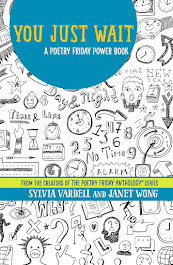 And if children enjoy this acrostic form, challenge them to try writing their own acrostic poems with book-related words of their choosing or partner this book with another Lewis collection of poems about books in The Bookworm’s Feast: A Potluck Of Poems, (Dial 1999). In the area of social studies, Lewis’ work could almost be its own curriculum. One could introduce biog raphy with at least three works by Lewis: Heroes And She-Roes: Poems Of Amazing And Everyday Heroes (Dial 2005), Vherses: A Celebration Of Outstanding Women (Creative Editions 2005), and Freedom Like Sunlight: Praisesongs for Black Americans (Creative Editions 2000). 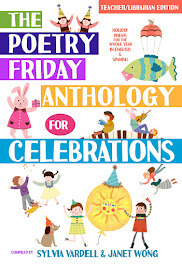 Tackle geography with A World of Wonders: Geographic Travels in Verse and Rhyme (Dial Books 2002), Monumental Verses (National Geographic 2005), and Castles, Old Stone Poems (Wordsong/Boyds Mills Press 2006) co-authored with Rebecca Kai Dotlich. 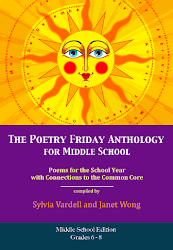 Post a world map and locate the settings for each poem. 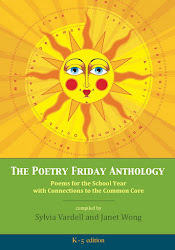 Encourage children to find or create poems for places on the map that are not yet in the books. 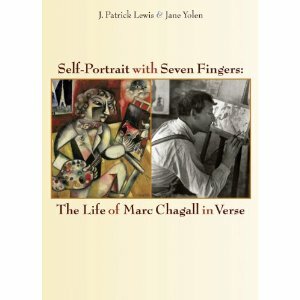 Check out the poet’s own web site for fun “historical” black and white photos of his own childhood. 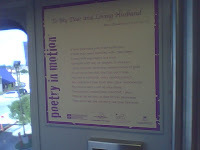 There are also excellent choices among his science and math-related poetry books beginning with his first book of poetry ever published, A Hippopotamustn’t: And Other Animal Poems (Dial 1990) to later works such as Scientrickery: Riddles in Science (Harcourt 2004) and Arithme-Tickle: An Even Number of Odd Riddle-Rhymes (Harcourt 2002). 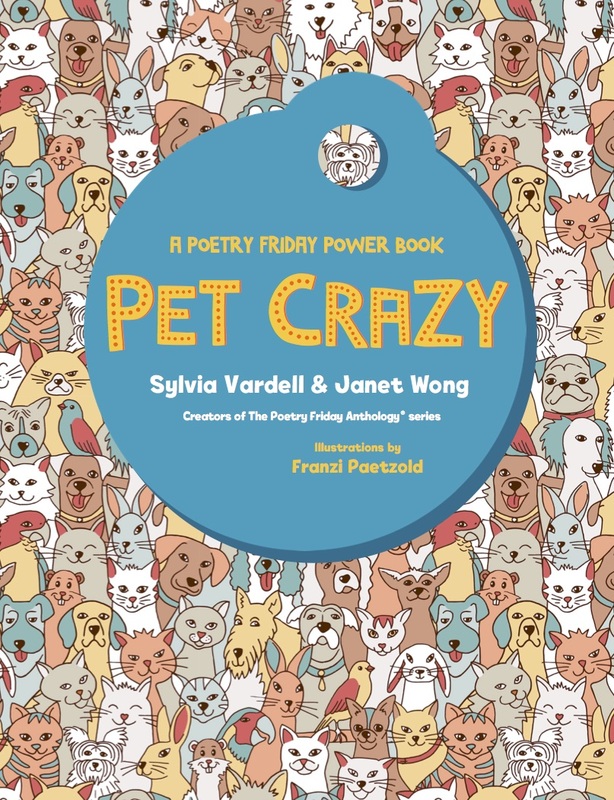 Not only are these poems rich in information, but they are playful and humorous and well-suited to reading aloud and performing chorally—in the library or in science class. Books of trivia, almanacs of facts, and accounts of strange and bizarre occurrences are extremely popular with children, esp ecially boys and J. Patrick Lewis has a wonderful parallel poetry collection to share entitled, A Burst Of Firsts (Dial 2001) which includes both famous accomplishments such as “First Men On The Moon” as well as not so well known feats by the “First Person Who Jumped Rope More Than 14,000 Times in One Hour.” Perhaps children will want to glorify their own firsts (first word, first day of school) in poem form or create “found” poems by arranging the words of a Guinness record setting article in list poem format. Lewis’ gift for finding poetry in the most unlikely places may motivate even the most reluctant poetry fan. Lewis, J. Patrick. 2007. The Brothers' War: Civil War Voices in Verse. Washington, DC: National Geographic. Lewis, J. Patrick. 2008. 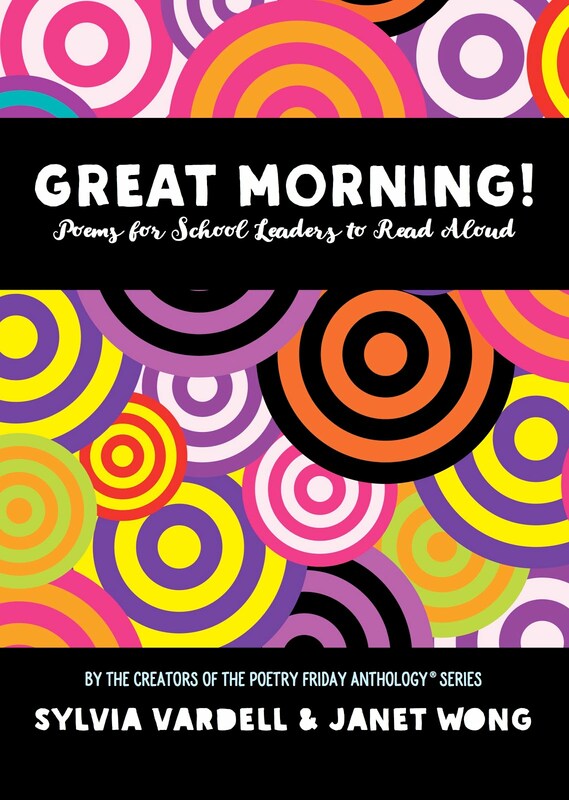 The World’s Greatest Poems. San Francisco: Chronicle. Lewis, J. Patrick. 2009. Spot the Plot! A Riddle Book of Book Riddles. Ill. by Lynn Munsinger. San Francisco, CA: Chronicle. Lewis, J. Patrick. 2009. The Underwear Salesman: And Other Jobs for Better or Verse. Ill. by Serge Bloch. New York: Simon & Schuster/Atheneum. 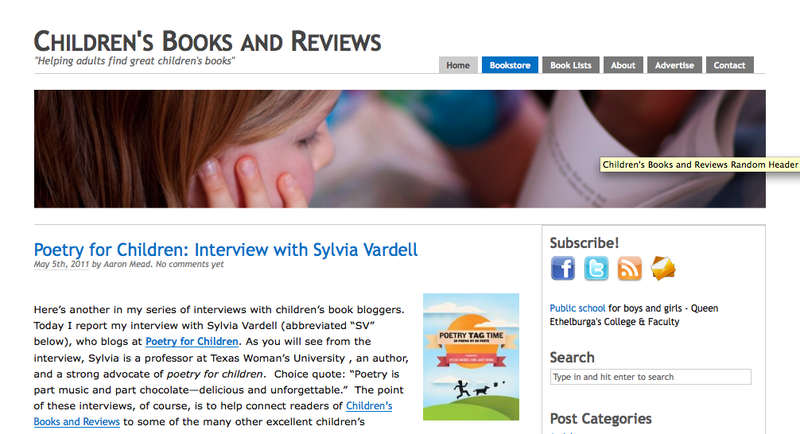 I'm also honored to be interviewed on Aaron Mead's blog, Children's Books and Reviews dedicated to "Helping adults find great children's books." Aaron is currently a Ph.D. student in philosophy at UCLA and he and his wife Angela (along with Amy, a librarian and other contributors) have a lot of interesting content there, including a critical awareness of the tendency to "commercialize" children's literature. It's always a treat to connect with one another across the blog-a-verse, isn't it? 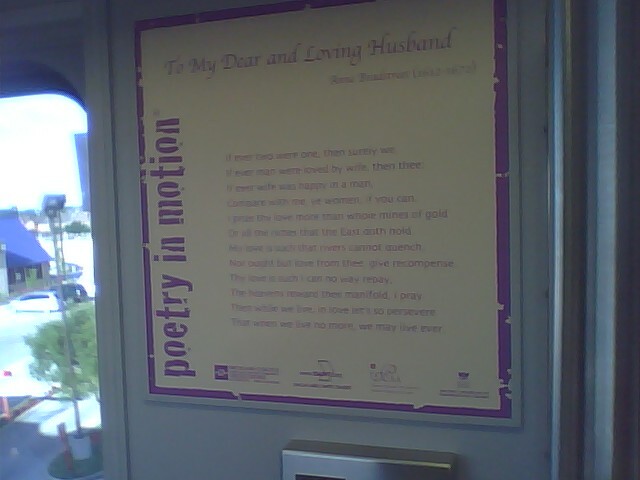 And just for fun-- I dis covered that the Dallas public transit system where I live is featuring Poetry in Motion with poems posted on trains around the city! I had seen this in New York, but didn't realize it had come to my own "neck of the woods." Yay!